David Salle (born 1952) is an American painter, printmaker, and stage designer who helped define postmodern sensibility. Salle was born in Norman, Oklahoma. He earned a BFA and MFA from the California Institute of the Arts, Valencia, California where he studied with John Baldessari. Salle’s work first came to public attention in New York in the early 1980s. Major exhibitions of his work have taken place at the Whitney Museum of American Art in New York, the Stedelijk Museum in Amsterdam, Museum of Contemporary Art, Los Angeles, Castello di Rivoli (Torino, Italy), and the Guggenheim Museum Bilbao. In March 2009 a group of fifteen paintings were shown at the Kestnergesellschaft Museum in Hannover, Germany. That same year Salle's work was also featured in an exhibition titled The Pictures Generation curated by Douglas Eklund at the Metropolitan Museum of Art in New York , in which his work was shown amongst a number of his contemporaries including Richard Prince, Sherrie Levine, Cindy Sherman, Nancy Dwyer , Robert Longo, Thomas Lawson, Charles Clough and Michael Zwack. David Salle also turned his hand to set and costume design, and to directing mainstream cinema. In 1986, Salle received a Guggenheim Fellowship for theater design, and in 1995 he directed the feature film, Search and Destroy, starring Griffin Dunne and Christopher Walken . He is a longtime collaborator with the choreographer Karole Armitage as he designs sets and costumes for many of her ballets. He is also a prolific writer on art. His essays and reviews have appeared in Artforum, Art in America, Modern Painters, The Paris Review, Interview, as well as numerous exhibition catalogs and anthologies. He was a regular contributor for Town & Country Magazine. His collection of critical essays, How to See, was published by W.W. Norton in 2016. Salle currently lives and works in Sagaponack, New York. Salle's work can be found in the permanent collections of numerous art museums, including the Museum of Modern Art, New York; Metropolitan Museum of Art, New York; Museum of Contemporary Art, Los Angeles; Los Angeles County Museum of Art (LACMA); Museum of Contemporary Art, Chicago; Walker Art Center, Minneapolis; Whitney Museum of American Art, New York; Tate Modern, London; and the National Gallery of Australia, Canberra, among others. 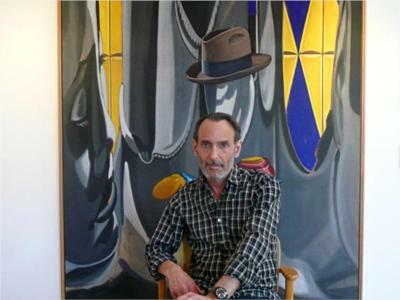 Artworks of David Salle are removed from WikiArt due to a copyright infringement notice.